Game recaps, Evgeni Malkin to have a disciplinary hearing, stars of the week, Kings trade Nate Thompson to the Canadiens, and more in today’s NHL morning coffee headlines. NHL.COM: Pittsburgh Penguins goaltender Matt Murray made 50 saves in a 4-1 victory over the Philadelphia Flyers to snap a four-game losing skid. Pittsburgh captain Sidney Crosby had a goal and an assist while Nick Bjugstad tallied his first goal as a Penguin. Pittsburgh Penguins center Evgeni Malkin faces supplemental discipline for swinging his stick at Philadelphia Flyers winger Michael Raffl (Photo via NHL Images). 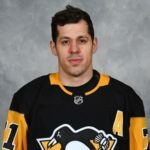 Penguins center Evgeni Malkin faces supplementary discipline for swinging his stick at Flyers winger Michael Raffl after the latter punched him in the back of the head. Malkin was ejected from the game. Penguins defenseman Olli Maatta left the game in the first period with an upper-body injury and didn’t return. SPECTOR’S NOTE: With the win, the Penguins (65 points) opened a three-point lead over the Carolina Hurricanes for the final wild-card berth in the Eastern Conference. Malkin was fined $5,000.00 last January for spearing LA Kings winger Dustin Brown. Raffl was grazed by Malkin’s stick but wasn’t injured, which could factor into whatever punishment the Penguins winger could face. Evgeny Kuznetsov scored twice and set up two others, including Alex Ovechkin’s 38th goal of the season, as the Washington Capitals defeated the Los Angeles Kings 6-4. Austin Wagner tallied twice for the Kings. San Jose Sharks center Joe Thornton picked up his 1,050th career assist to pass Gordie Howe for ninth on the all-time list during his club’s 7-2 drubbing of the Vancouver Canucks. Evander Kane scored twice for the Sharks, who’ve have won 11 of their last 12 contests. The Canucks were playing without goaltender Jacob Markstrom (undisclosed) and center Brandon Sutter (lower body). SPECTOR’S NOTE: With the loss, the Canucks (57 points) remain two points behind the Minnesota Wild for the second Western Conference wild-card spot. St. Louis Blues goaltender Jordan Binnington, Boston Bruins center Patrice Bergeron, and Chicago Blackhawks center Dylan Strome are the NHL’s three stars for the week ending Feb. 10. The Montreal Canadiens yesterday acquired center Nate Thompson and a fifth-round pick in the 2019 draft (originally belonging to Arizona) from the Los Angeles Kings in exchange for a fourth-round pick in 2019 (originally acquired from Calgary). The Canadiens also called up winger Dale Weise, who was acquired on Saturday from Philadelphia. SPECTOR’S NOTE: The Canadiens acquired Thompson and Weise to shore up their fourth line, which has been a problem area this season. CHICAGO SUN-TIMES: The Blackhawks yesterday announced goaltender Collin Delia signed a three-year, $3-million contract extension. NJ.COM: The New Jersey Devils claimed forward Kenny Agostino off waivers from the Canadiens. CBS SPORTS: The Colorado Avalanche recalled winger Tyson Jost. TUCKER HOCKEY: Provides a diagram explaining how the NHL became a billion-dollar business. As at now …. The result of this injury will only lead to (due to Sully’s complete blindness) an increased JJ on ice time …. very scary. Clamping down on contact to the head I’m good with. What drives me bonkers about these things is the Raffl gave a big league cross check that should be called and then a right cross to the back of the head. Raffl should get a minimum of 1 game up to 5 for that punch. Clear intent to injure. Contact to head, unsuspecting player. Malkin should get 1 to 3 games for being stupid. Why the NHL likes to allow their best players to be grossly targeted makes me scratch my head. Between that, 3 on 3 OT and shootouts this game is becoming hard to bear. We punish murder and attempted murder differently. Everything is judged by result and not intent. And yes, it’s stupid. I love Geno, but he should get 5 games for that. Completely unnecessary and recklessly dangerous. If the suspension is based on injury then the guy being suspended should be out the same amount of time the injured player is. THAT would make sense. Hey Lyle. One of the best stories from yesterday was Michael DiPietro getting the start in net for Vancouver. He wasn’t great but the team in front of him was worse. A good opponent and some bad bounces made for a rough night, but he battled hard. That’s a tough spot to put a teenager in. Major props as far as I’m concerned. If the ‘Nucks don’t pull a goalie out of a hat he’s heading to California for three in four nights. If that works out, I say we make him Prime Minister.